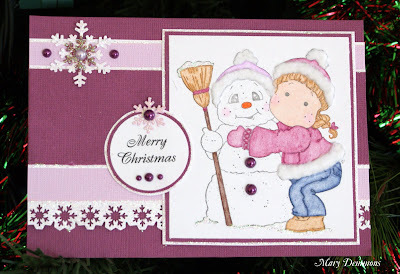 I made this Christmas card using Magnolia's Snowy Hug. The sketch is from Sweet Sunday Sketch. I used the colors lilac, orchid and white. I added crystal stickles to the white cardstock, image and snowflakes. I also added white flocking to the image. I added a light purple pearl to the center of the snowflake and purple pearls beside the snowflake, on the sentiment and on the image. What a gorgeous card, I love the colours you have picked. What a lovely Tilda image. Thank you for joining us over at Lexi's Creations - good luck in the challenges. I love this Magnolia stamp. You created a delicious card! Thanks for sharing with us at OSAAT. Happy Holidays and creative crafting in the New Year. Mary, I think you like this image!! heehee. you made me smile with so many adorable takes on this stamp! Way to go ! Thanks for sharing your ANYTHING GOES CHRISTMAS creation with us at Creative Inspirations this fortnight! Best of luck to you and happy holidays!! This is such a sweet image! Thanks for playing along with us at Lexi's Creations. What a great Christmas card, love that colourscheme! Sweet and lovely card, thanks for joining Fresh brewed designs two weeks long christmas challenge. That's so cute. Thanks for joining the challenge at creative inspirations.